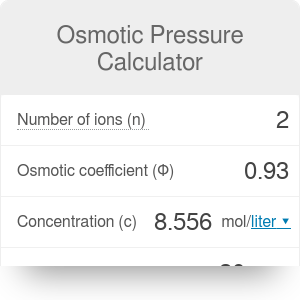 This osmotic pressure calculator is a tool that helps you calculate the pressure required to completely stop the osmosis process. In this article, we will provide you with all knowledge required to understand how it works: from the osmotic pressure equation to a complete example of calculations. You will also learn what is osmotic pressure by definition. If you were ever wondering how to calculate the osmotic pressure, you've come to the right place! Osmosis is the process in which a liquid passes through a semi-permeable membrane. The pores of the membrane allow solvent molecules to pass through, but are too small for the larger solute molecules - the membrane is impermeable for them. Osmotic pressure is defined as the minimum pressure that needs to be applied to a solution to prevent its flow through the semi-permeable membrane - in other words, to completely stop osmosis. Applying such a pressure allows the solution to achieve osmotic equilibrium. It finds application in many industrial and chemical processes, such as water purification, water desalination, and waste material treatment. π stands for osmotic pressure. It is measured in units of pressure - most typically in Pascals (symbol Pa) or bars. n is the number of ions produced when the solute undergoes dissociation. It is also called the dissociation factor or the van't Hoff factor. Most typically it ranges from 1 (for substances that cannot be dissociated) to 3. Φ is the osmotic coefficient of the given solute. It is a unitless factor dependent on the type of substance. Its value is most often close to 1. You can find the value of this coefficient for the most common substances in the end of this article. c stands for molar concentration of the solution, measured in mol/liter. You can either input it directly or open the advanced mode to calculate it from the mass of solute and volume of the solution. R is the universal gas constant. It is equal to 8.314 J/(K*mol). It is also used in our ideal gas law calculator. T is the temperature, measured in Kelvins (symbol K). If you want to find osmotic pressure, simply follow the steps below. Choose a solute to analyze - for example, sodium sulfate (Na₂SO₄). Copy the values of dissociation factor n, molecular weight M and osmotic coefficient Φ from the list below. In this case, n = 3, M = 142 and Φ = 0.74. Decide on the temperature of the environment in thich osmosis takes place - for instance 30°C, what is equivalent to 303.15 K.
If you know the molar concentration of your solution, you can input it directly into the osmotic pressure calculator. If not, you need to determine the mass of the solute (for example 1 g) and the total volume of the solution (let's assume 0.1 L). c = m / (M * V) = 1 / (142 * 0.1) = 0.07 mol/L. Substitute all of this data into the osmotic pressure equation or simply input in into our osmotic pressure calculator to obtain a result - in this case, the pressure is equal to 3940.56 hPa. The table below lists the most common substances along with the number of ions obtained by dissociation n, molecular weight M and osmotic coefficient Φ.
Osmotic Pressure Calculator can be embedded on your website to enrich the content you wrote and make it easier for your visitors to understand your message.